Welcome to FloralYellowPages.com, the Florist's resource dedicated to helping independent Flower Shop owners promote their business, attract new customers and drive qualified buyers to their store or web-site. FloralYellowPages.com can put your business in front of thousands of customers that have an immediate need to purchase flowers for delivery in your town. Your listing will be shown when a customer searches our directory for a florist in your area. 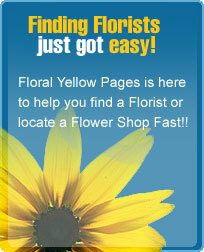 FloralYellowPages.com offers several ways to get your business in front of targeted flower buying customers. Platinum Listing- Enhanced listing that will appear in the city of your choice. Placement is by seniority at the Platinum level. 1. 125x125 Feature ad showed on the right side of every selected page. Prices and placement subject to change. FloralYellowPages.com Inc. reserves the right to refuse any advertisement or listing.